Here's novel number five by the perennially popular author of Shining Through and Compromising Positions--though this one's more like the latter than the former, set in the present on Long Island (a locale Isaacs does perfectly) and zinging with her trademark sharp, make-me-into-a-movie repartee. 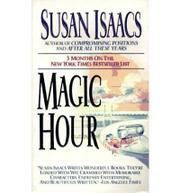 Isaacs gets the award for the fastest hook in commercial fiction, letting on in paragraph two, through her narrator Steve Brady, that the classy movie producer Sy Spencer has been murdered with a .22, fired from the manicured bushes of his Southampton estate. It's Steve's business because he's a Long Island homicide detective, not to mention a recovered alcoholic and Vietnam vet, currently about to wed pretty, nice, boring Lynne, who teaches disabled kids. He suspects Sy's ex-wife, Bonnie, right off the bat, since she lives in nearby Bridgehampton, needs money and Sy's approval of her new screenplay, and knows how to shoot. What's more, Steve finds there's something distinctly weird about her when he chats her up, and something disturbingly attractive, too. Right before he's about to make the collar, though, Bonnie's lawyer reminds Steve that he picked her up in a bar about five years before--an event that would have been memorable had Steve not been in an alcoholic daze at the time. Now, however, he can't get her out of his system and even helps her evade an arrest warrant as he sets out to uncover the real killer. The trail leads to the bitchy, beautiful star of Sy's new picture, Lindsay Keefe, a backer with ties to the Gambino family, and finally close to home, for it seems that Steve's brother worked as a gofer for Sy. In the end, Steve gets his man, of course, and it isn't Bonnie--a good thing, too, since the two of them are clearly fated to spend the rest of their lives watching Yankee games together. Primitive as police procedurals go, and occasionally Steve's hard-boiled voice doesn't ring true. But this has the same witticism-wrapped, sappy center that always drives Isaacs fans dotty.